After the success of last year’s event, churches in Downend, Mangotsfield, Emersons Green and Staple Hill are putting on another day of worship, fun and free activities for the whole community on Sunday June 23 in King George V Park, Downend. Beginning at 11am with an outdoor service of worship, seven local churches are joining together for C in the Park. ‘‘We want to show God’s love for our community and what better way to do that than by putting on a free event, open to everyone” said Rev Andy Machin minister of Downend Baptist Church and part of the organising group. 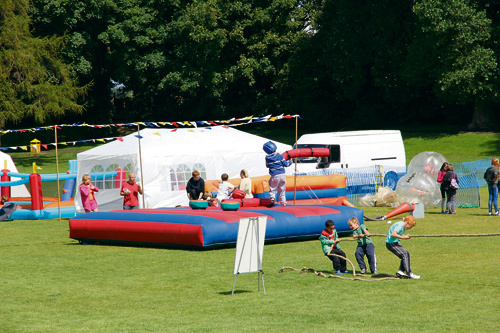 Additional activities have been added to the range of outdoor games and inflatables , including a climbing wall and rodeo bull; the ARK bus will be on site, together with a children’s activity tent and once again there will be team games including five-a-side soccer and tug of war. C in the Park also gives local groups an opportunity to showcase their talent, as they perform on the stage throughout the afternoon.